Theme Hospital is a simulation computer game developed by Bullfrog Productions and published by Electronic Arts in 1997, in which the player designs and operates a hospital. Like most of Bullfrog's games, Theme Hospital is permeated by an eccentric sense of humour. 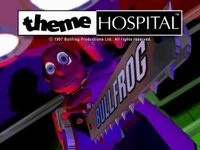 The game is the thematic successor to Theme Park, a game also produced by Bullfrog.